1. Skywriting. A great technique to teach sound and form of 26 letters and 4 digraphs! 2. Read and write the sound from dictation. 3. 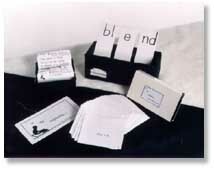 Read and write (from dictation) blended sounds using the blending box. 4. Read and write sentences from dictation using the file box. The file box has 300 cards, 39 of them are label (instruction) cards. Each label card has easy-to-follow directions on what to do with the cards behind it. Each label card represents a new sound or phonetic skill. There are over 1200 sentences for the child to read and write from dictation. There is no isolating or flashcarding of words. All phonetic skills are taught in the context of sentences. The file box is approached with the idea that we are looking for what the child does not know and, therefore, you do not instruct until the child comes to something he does not know. You have his attention and that is the time to instruct. The file box will challenge your child without bombarding him with so many new ideas that he becomes frustrated. No picture clues. All the books are plain black and white with questions at the end for the child to answer in complete sentences. Lois believes that color and picture clues distract beginning readers. Children need to develop the habit of focusing on print, not searching for picture clues. Lois taught her 4 1/2 year old granddaughter to read and write simple sentences over nine months using only these materials. Her granddaughter had no prior knowledge of letters and had no interest in learning how to read. Lois used her 4 1/2 year old granddaughter to show that even with an inattentive child, whether they be 4 or 10 years old, this program works. It works because Lois has eliminated all the “clutter” that permeates all programs she has seen. Reading is a simple process. Good teaching is making a difficult task simple.